The purpose of this Society is to collect and preserve Vermont Folklore. 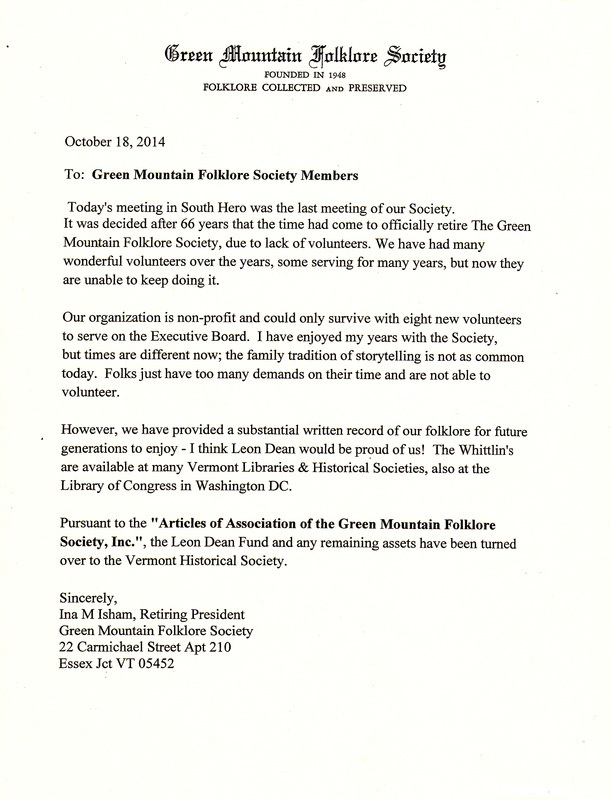 Sadly after 66 years on Oct. 18, 2014 the Green Mountain Folklore Society was dissolved due to lack of volunteers. We have a wonderful history that will live on for years to come. Our members were all great folks, but times have changed and they are all too busy to keep GMFS active. So many demands on our time now a days makes it impossible to do everything. All the necessary paperwork has been taken care of and per our constitution; the Leon Dean Fund and our remaining assets have been transferred to the Vermont Historical Society (See Photo left). I will keep telling and writing my folklore stories and hope you will too!. A great big thank you to all our loyal members. FOLKWAYS: Ceremonies, customs, remedies, household hints, handicrafts, costumes, games, dances. FOLKSAY: Proverbs, puzzles, mottoes, diaries, local words and expressions, epitaphs, local sayings. FOLK BELIEFS: Supernatural occurrences, weather signs, dreams, omens, prophecies, planting beliefs. FOLK TALES: Legends, ghost stories, anecdotes about historical figures, places or events, fables, myths. FOLK VERSE: Childhood verse, descriptive verse about persons, places, objects, poems that are patriotic, religious or humorous, and love poems. FOLK SONGS: Songs about heroes, tragedies, ceremonies, games, work, political campaigns, tavern songs. Keep writing your folklore stories! We can add them here on the website. Remember you are the only one who has your story.